Peg-Pérego Tatamia Multipurpose Baby Seat (Newborn Recliner, Swing & High Chair) - Free Shipping! The extremely versatile Tatamia Multipurpose Baby Seat is a recliner, a feeding high chair and a soothing, relaxing swing to keep baby happy. 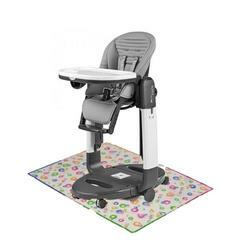 This chair also has dual trays for easy clean-up providing the ultimate dining and playing environment for newborn infants up to toddlers. The Peg-Pérego Tatamia Multipurpose Baby Seat (Newborn Recliner, Swing & High Chair) is the perfect multifunctional seat for baby. The Tatamia Multipurpose Baby Seat can be easily folded into a compact unit that requires very little space. The large dual trays can be removed and is dishwasher safe. The cushion cover can be cleaned with a damp cloth. Designed to take the place of three pieces of baby equipment, the Tatamia is extremely versatile. It's a height-adjustable to nine different positions and a comfortable recliner for newborns (that fully reclines!) and quickly changes into a soothing, relaxing swing to keep baby happy. 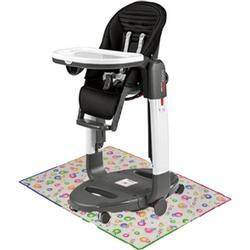 And it's also a high chair that converts to a youth chair to keep up with the needs of a growing child. Even the footrest is adjustable to three positions for comfort. The innovative base has a smaller "footprint" for closer contact and its spring-loaded design allows the Tatamia to fold easily and compactly for storage. The five point safety strap and front bar strap keep your child in complete safety. Large double trays can be removed; Dishwasher-safe for easier clean-ups. A multipurpose seat that quickly converts from recliner to swing to high chair. newborn infants up to toddlers. A soothing, relaxing swing with gentle-glide ball bearing action. Five-point safety harness and passive restraint system. Plush padding keeps infant comfortable and secure. the seat can also be removed from the main frame. Mar-resistant Castor wheels automatically lock for safety.